Looking up at the 205-foot neo-Gothic and art deco Singing Tower carillon is an experience like no other. We were able to celebrate Valentine’s Day at this one of a kind location! We were greeted at the entrance gate and given the history of the grounds. 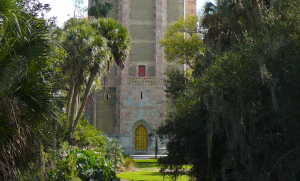 The tower was designed by famed architect Milton B. Medary and ornately crafted by noted stone sculptor Lee Lawrie, the Tower houses one of the world’s finest carillons. As we made our way up the drive, the tower started playing harmonious tunes. It was like nothing we’d ever heard before. Our journey didn’t end there. We also were given the opportunity to tour the Gardens and given the history of those. Bok Tower Gardens boasts one of the greatest works of famed landscape architect Frederick Law Olmsted, Jr. We were told that the historic landscape garden was designed to be a contemplative and informal woodland setting offering a series of romantic recesses and tranquil resting spots, picturesque vistas and breathtaking views of the Singing Tower. It was a long, but enjoyable afternoon strolling through the gardens and singing tower. The grounds were breathtaking from the acres of ferns, palms, oaks and pines that fashioned a lush backdrop for flowering foliage. We look forward to our next visit to view this showcase of ever-changing artwork.